My paternal grandfather’s death was the first one I ever experienced. Though it was long ago, I still remember his smell, the way his skin would blend with the aroma of those dime-sized powdery mints he liked to chew. I remember his thin baby-white hair circling his head like a laurel crown. The way he would grunt his approval under his prickly mustache and chuckle raucously when I would scurry away with one of his many Italian hats, all different shapes and sizes. While he never spoke about it, I collected fragments of his life from my father and grandmother: the snapshot of a man escaping from a French concentration camp through the sewers; that one story about three fascists killing his friend; the way he agilely grabbed their gun and shot one of them dead. I could not tell you more of his life story, though I wish I could. As he aged, he progressively shrunk into a kind of despair so familiar in my family that nobody considered it a cry for help. My grandmother, his primary caretaker, would run around with pills, bottles, fresh clothes and shower-safety contraptions I never understood. However, she was ill-prepared to care for his psychological, emotional, and spiritual needs. By the time I was 22, my grandfather had attempted to overdose on his medications, not one, but three times. His depression was worse than it had ever been and he made no secret of his desire to die as soon as possible, to leave this living hell he was trapped in. His closest family members were ravaged by severe anxiety, panic attacks, and depression. From as long as I can remember I have had this feeling that there was something hidden about the process of death, some important kind of magic we were missing out on. Eventually, this became a fundamental part of my path, prominently featured in my professional practice as a body-centered psychotherapist specializing in depression and life-meaning. Some wonder why we should entertain such gloomy topics anyway, lest we find ourselves bogged down by this unnecessary heaviness. To them I would say that death-awareness itches all the time, that it rumbles continually just under the surface, that our real choice is between letting it fester in our unconscious or leveraging it to experience feelings of meaning and deeper connection. Recapitulating what Buddhists had long known, Existential Psychotherapist Irvin Yalom has identified our denial defenses against death and impermanence as a root cause for most kinds of psychological distress. When the process of death is directly experienced by those who are, temporarily, going to continue on living, it has the potential to be a deeply transformative rite-of-passage. These kinds of “boundary experiences," as they are often referred to in philosophical literature, can jolt us into a state of mindfulness of being, plunging us into more authentic life modes, helping us to re-prioritize what’s truly important to us, and enhancing the overall pleasure of living. Unfortunately, the death industry has been taking over this delicate and precious process for the families, at least in Western societies, with the result that grieving has become harder to process and our disconnection to the cycles of life and death are perpetuated. While the new and fast- growing movement of death midwifery highlights the importance of choice—including “traditional” funerary practices handled by funeral homes—we must reclaim this sacred rite from the hands of a multi-million dollar industry that capitalizes on keeping individuals and their families in the dark when it comes to their actual options - options which include perfectly safe home rituals, green burials, and much more. By supporting the dying process, by being really present with it, we can provide our friend, family member, or client with the opportunity to prepare for this important and very intimate transition. We can support them in engaging in a narrative review of their life and their legacy; address practical matters, such as providing knowledge about options, and planning for how the last days will unfold; and create a space of physical, emotional, and spiritual comfort. Through this process, we who are touched by this death are inevitably re-connected to that profound source of vitality which invites us to remember our responsibility and our inter-connectedness. The acknowledgment of the big, small, and sometimes invisible (to us) ways in which we have profoundly touched each other helps us see the way it ripples out into the world. We can touch into a deeper knowing that ultimately we are not such isolated, hopeless creatures, but rather we are part of a much larger picture of birth, growth, change, death and re-constitution as something else—even if that is “just” a pile of fertile soil, or the seed of a change that we never knew we planted. I often wonder about how I might have related to my own life had my family and community related to death and dying differently — in a sacred way, one that is spacious enough to move with grief so as to avoid stagnation resulting in a threatened stillness of denial. I might not be able to change my grandfather's dying experience, but I now know that there are alternatives. Francesca Bini is a Registered Somatic Psychotherapist and Certified Nature-Connected Coach residing in Boulder, CO. She specializes in working with adults struggling with feelings of depression, burnout, isolation, existential anxiety, and major life transitions, who are looking for a way to reconnect with a sense of meaning in their lives and of empowerment in their embodied experience. 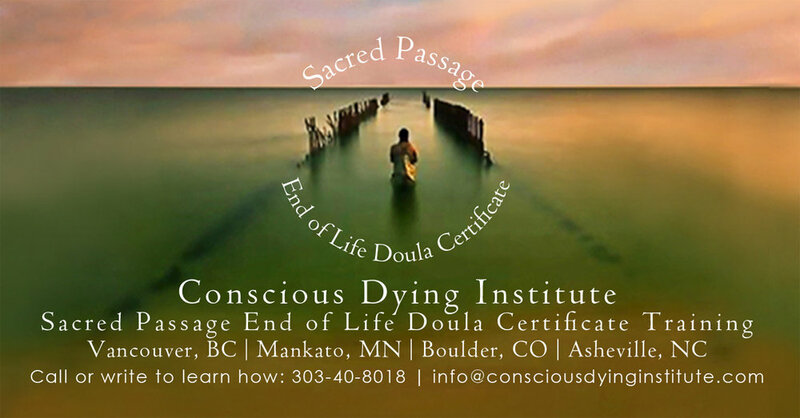 Francesca is currently training to become a Death Doula in order to support this profound rite-of-passage for her clients and their families. She loves to write about psychological science and the power of our creative unconscious.